The Israeli Knesset’s Foreign Affairs and Defense Committee approved a bill, on Wednesday, to deduct funds transferred to the Palestinian Authority (PA). Israeli Ynet news outlet reported, according to Ma’an, that the deduction would be equal to the amount of funds the PA gives to the families of killed Palestinians. The bill’s original draft, there, which states that there would not be any flexibility regarding funds deducted, passed its first reading. 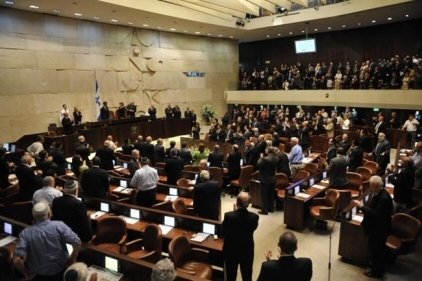 The Knesset members rejected the Israeli government’s objection to the bill, proposed by Knesset members Eliezer Stem, of “There is a Future”, and chairman of the committee Avi Dichter, of the Likud, an extreme right Israeli political party, of which Prime Minister Benjamin Netanyahu is a member. The committee contradicted Netanyahu’s position on the bill and went forward with approval for its final version. According to the bill’s proposal, the Palestinian Authority transfers 7% of its budget, estimated at 1.1 billion shekels ($300 million), financed largely by US and European aid, to pay salaries and funding for Palestinian prisoners, and to pay stipends to families of killed and wounded Palestinians. Earlier this week, the United States suspended aid funds to the West Bank and Gaza under the “Taylor Force Law”, which was passed in March of this year, and will prevent the PA from paying monthly stipends to the families of killed, wounded and imprisoned Palestinians.